NEW YORK TIMES bestselling author Kathryn Shay spent five years riding fire trucks with a large city fire department, eating in their firehouses and interviewing hundreds of America’s Bravest. 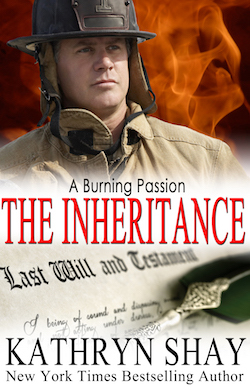 Read the firefighter romance novels that resulted from her intense relationship with firefighters! Former friends turned lovers and a billionaire who changes both their lives with an inheritance…what more could two people want? In the newest installment of the beloved Hidden Cove Series, Dan Collins is everybody’s favorite firefighter. He’s good at his job, is a nice guy and treats people well. But his life fell apart a year ago when his wife left him for a wealthy man. Thank God Dan has had Firefighter Lucy Coretta to lean on, both at work and at home. She’s brought him back from the brink of despair and has been there for him during all those horrible months after the divorce. Unbeknownst to him, Lucy has been in love with him forever but kept it to herself. Then, when he split with his wife, she didn’t want to be a rebound girlfriend. One night, though, passion explodes between them and by the morning everything has changed. And not just in their relationship. A man comes to the door and hands Dan an inheritance from a wealthy billionaire for saving the lives of his godchildren years ago. It’s money, lots and lots of money. Unfortunately, the windfall doesn’t bring him happiness. It messes up all his newly made plans with Lucy and throws them both into a tailspin.